A necktie has always been the square root for getting respect when it comes to your menswear game. It's having the confidence to wear your ensemble with honor and let everyone know who you are in your abilities. 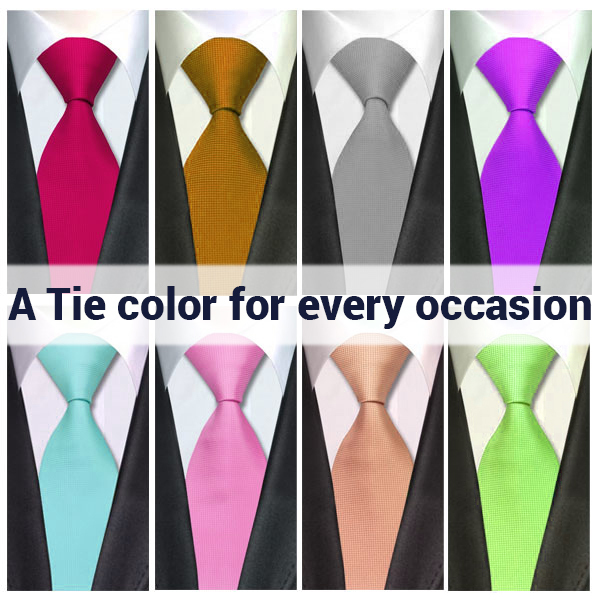 Let's take a look at what color will work best on a tie during crucial events. A red color, ocean blue or a vibrant lemon? Below is the quick list of common events where wearing the right tie is imperative. A job interview – For this occasion go for plain, blue or conservative red; these colors won't distract the interviewer, but will match your suit elegantly. If you are applying for the position of manager or executive, go for red because this color has the power of influence. On the other hand, if you are applying for the position of a subordinate, blue is perfect because it describes as an indicator of stability and give sparks to an employer you are a reliable worker. An important presentation – golden yellow would be perfect for this occasion; because this radiates energy and liveliness but doesn't pull focus from your subject matter. Apparently, avoid wearing busy pattern like paisley when presenting your work, this will eventually distract your audience. A night out – the perfect choice is Black; nothing says” mysterious, smart and seductive” like a crisp dark tie. If you want to add a little more to your look, find a tie with a crisp pattern or something subtle or too bold, sharp zig-zags will put your night out perfectly. An important High Impact event – Pink makes a splash of the statement. A light, bright shade gives an appearance of modishness and confidence in equal measure. All eyes will be drawn straight towards the fuchsia, thus giving the lavishing look. Now, you know what colors you need to mix match with your tie for different events, good luck with that and keep dazzling your look.